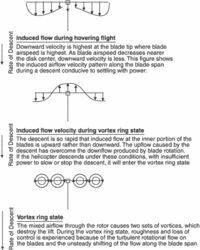 An unstable condition of powered flight in which the helicopter settles in its own rotor downwash. In this case, the helicopter descends in turbulent air that has just been accelerated downward by the rotor. The reaction of this air on the rotor blades at high angles of attack stalls the blades at the hub (center of the rotor), and the stall progresses outward along the blade as the rate of descent increases. The combination of conditions likely to cause settling with power are low forward speed on the order of 10 knots or less, 20% or more engine power, and a rate of descent equal to or greater than 300 ft/min. Hovering out of the ground effect and a tailwind approach are conducive to a settling-with-power situation. A proper glide path will avoid settling with power. Recovery may be accomplished by increasing the forward speed and/or partially lowering the collective pitch and moving the cyclic forward. Also called a vortex ring state.